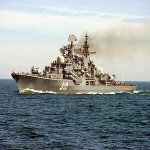 The Baltic Fleet is the oldest Russian Navy formation. It was established by Peter the Great on May 18, 1703. This day became the date of Baltic Fleet Day. The Baltic Fleet was established by Peter the Great during the Great Northern War. He based the fleet in Kronstadt. The first naval vessel was received in 1703 and it was a 24-gun three-masted frigate Shtandart. By 1724 the fleet consisted of 141 sail warships and hundreds of oar-propelled ships. Modern Baltic Fleet is headquartered in Kaliningrad with main bases in Baltyisk and Kronstadt. As of 2008 it had 75 combat ships of various types and 23 aviation units. It also includes coastal troops, air defense warfare and unified bodies of front, logistic and technical support. Annual observance of Baltic Fleet Day includes a naval parade, that is followed by the marines model performances. The veterans, locals, visitors and the commanders lay flowers to the memorial of the founder of the Baltic Fleet, Peter the Great.